Peugeot selects Luran® S and Novodur® for the new 208 model front grill. Specialty styrenics as material of choice for design, durability and cost-effectiveness, INEOS Styrolution continues to advance application innovation in the automotive industry with Luran S and Novodur. For the seventh generation of the Peugeot 208, the leading French manufacturer wanted to use lightweight, cost-efficient plastics while improving on aesthetics, durability or performance. 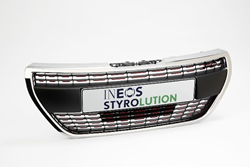 So Peugeot turned to INEOS Styrolution, the global leader in styrenics, for the facelift of its 208 model. A grade of Luran S and Novodur were identified respectively by Faurecia and Plastivaloire as the materials of choice for the front grill and its frame offering high heat resistance and impact strength, unique surface properties and enhanced UV-stability. After the successful implementation of Luran S and Novodur, Peugeot decided to use INEOS Styrolution’s grades for other models which will be officially launched in 2016. “Whether for front grilles, logos or rearview mirrors, automotive exterior applications based on styrenics solutions are growing. It is not just superior performance and physical durability that make styrenics attractive for manufacturers all along the automotive value chain, they address two of the attributes most desirable to automotive OEMs and suppliers: appearance and low weight. INEOS Styrolution delivers innovation and professional support with an experienced, personal touch. We are honored to continue a successful partnership with Peugeot through the development of this automotive solution,” says Christophe Ginss, Sales Director Automotive EMEA at INEOS Styrolution. Lasting quality on the road: Two components of the Peugeot 208 that were re-evaluated in the facelift process were the front grill and its frame. Two INEOS Styrolution products contribute to the high quality and aesthetic appeal of the new 208 model. The first is Luran S 778T, an acrylonitrile styrene acrylate (ASA) copolymer, which was used for the front grill applying the hot stamping technology supplied by Leonhard KURZ (manufacturer of decoration foils and equipment). Offering high surface quality, as well as major advancements in color fastness and optical appearance for pre-colored unpainted exterior applications, this material addressed both the aesthetic and functional requirements of Peugeot. Novodur P2MC was used for the frame of the front grill. This grade belongs to the Novodur ABS product family and features a well-balanced mix of properties for injection molding, including good impact strength, dimensional stability and heat resistance. Additionally, its easy processability and the highly defect-free surface of the resulting finished parts, made it an ideal solution for plated or painted applications used in vehicle exteriors. Thanks to the ability of this grade, the face lifted frame is either painted or chrome plated depending on the corresponding model. Guaranteed quality with customized solutions: INEOS Styrolution has a proven track record of successful decorated applications with Leonhard KURZ foils for hot-stamping technology which are used in the automotive market. Decorative solutions offer long-term surface quality, resistance to UV, humidity, chemicals and scratch. Additionally, high flow materials from INEOS Styrolution’s portfolio offer a broader processing window for in-mold decoration, no foil deformation, allow complex part design and reduced reject rate of finished parts. Different colored transfer foils are used in order to deliver versatility related to the different models. A universal solution: A trusted material with excellent property retention, Luran S and Novodur will be used in front grills of additional Peugeot models to be launched in 2016. You find further information on our latest automotive innovations and news in our automotive emagazine: http://auto-emagazine.com/201601/.